I love cinnamon buns. So much so that I purposely plan my way through the mall to avoid Cinnabon. If I end up smelling them, I’ll end up buying one and eating the whole thing. Which isn’t such a bad thing, but sometimes you’ve gotta save your tummy space, you know? When in Tokyo earlier this year, we happened upon a Cinnabon in the back streets of Roppongi. That familiar sweet cinnamon-sugar smell instantly made me homesick and I wanted to line up but I felt completely ridiculous because I was in TOKYO for goodness sake. Did I really want to wait in line to eat the cinnamon buns at an American chain bakery when there were so many more delicious artisanal cinnamon things to be had?! The answer was yes, of course, but the line ended up being too long to wait in (Tokyoites like lines!) so I didn’t end up getting a cinnamon bun. Insert sad face. I had to drown my sorrows in taiyaki, which isn’t too shabby a way of drowning, if you ask me! Hmm…maybe I should work on a cinnamon roll taiyaki?! 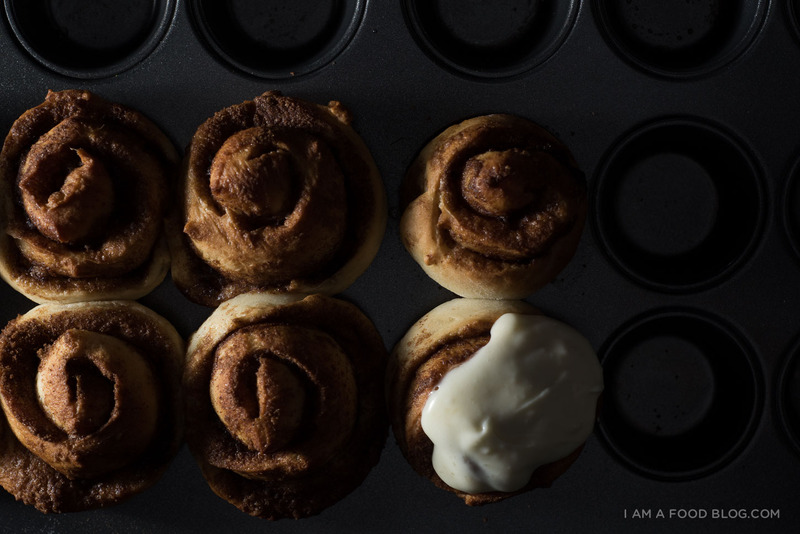 Taiyakis aside, these little cinnamon buns whipped up pretty quick. They barely need any kneading and they’ve got just a short rise of 40 minutes. A quick bake in the oven and you’ve got yourself fresh buns in just about an hour – even shorter than the Cinnabon line in Tokyo. Combine the milk, butter and sugar in a small sauce pan. Stir over low heat until the sugar dissolves and the butter melts completely. Remove and let cool until just warm. Sprinkle on the yeast. Stir and let sit for 5 minutes so the yeast can activate. In a bowl, stir together the 3/4 cup of flour and salt. 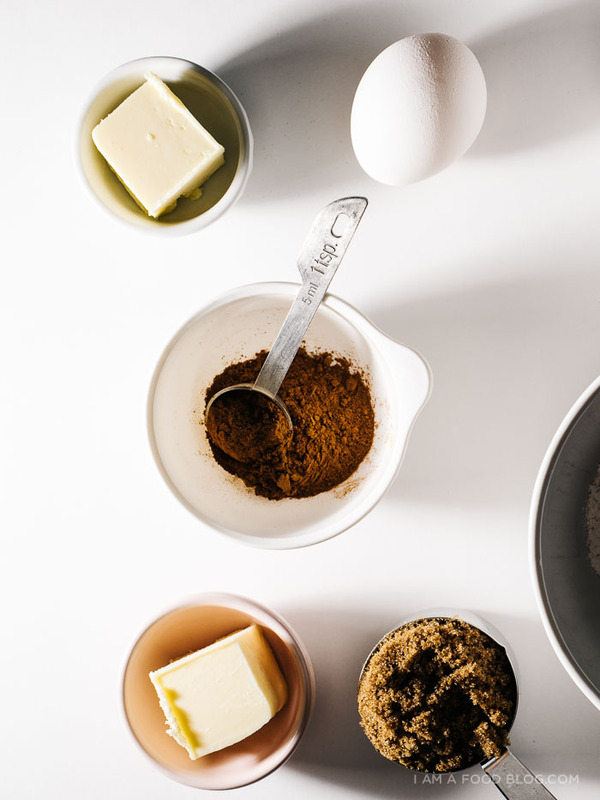 Add the milk mix and egg yolk and use a wooden spoon to mix until incorporated. Add more flour, as needed, if the dough is too wet. 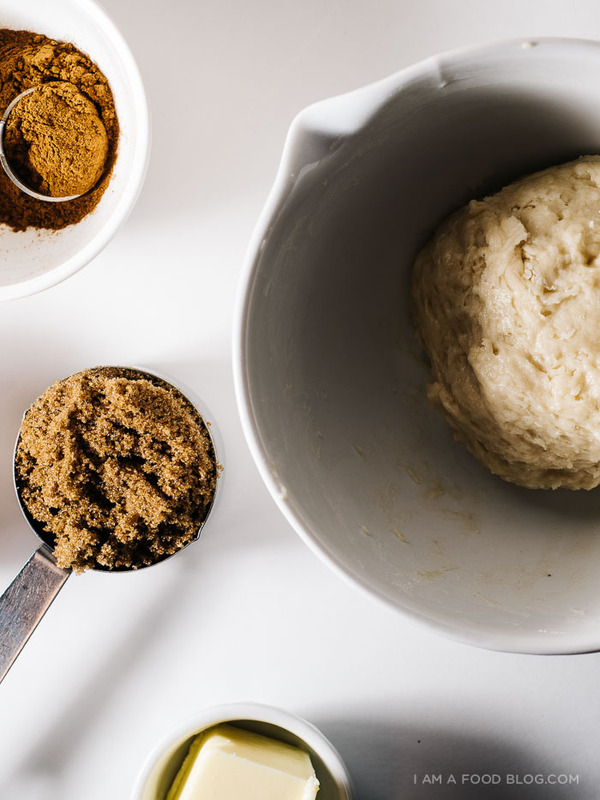 Bring together into a ball and knead with your hands for a couple of turns. Cover with plastic wrap and let rest for 10 minutes. Roll out onto a lightly floured work surface into a rectangle about the size of a regular sheet of paper. 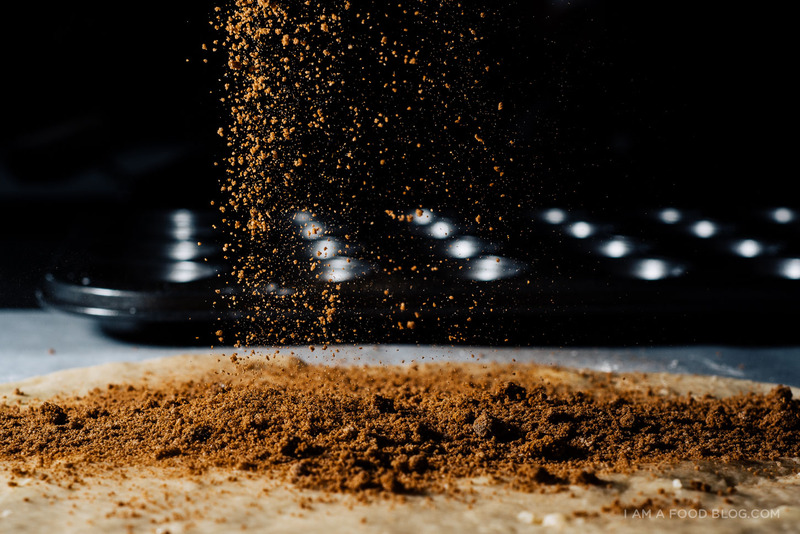 Spread the room temperature butter out evenly over the dough and then evenly sprinkle on the cinnamon-sugar-flour mixture. 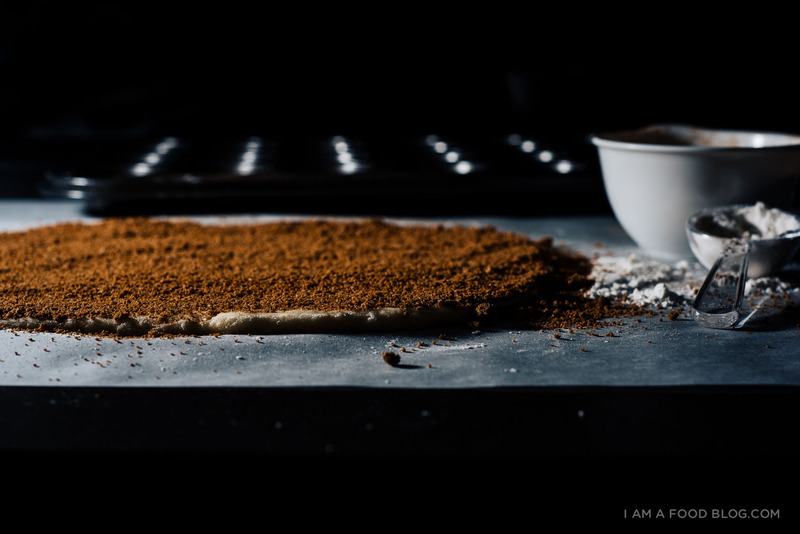 Roll the dough up, starting at a long edge. Cut into 8 equal pieces and place in the prepared muffin tin. Cover with saran wrap and let rise for 30 minutes. Remove the plastic wrap and bake for 15-20 minutes or until golden brown, puffy and bubbly. While the buns are baking, make the frosting. Cream together the butter and sugar until light and fluffy. Fold in the whipped cream cheese and whisky until smooth. Set aside in the fridge. When the buns are done, the tops should be golden brown and a skewer poked through should come out clean. Frost immediately for the Cinnabon look. Let cool slightly and enjoy warm. Notes: Half an egg yolk is about 1/2 tablespoon. Separate your egg, then measure out 1/2 tablespoon. 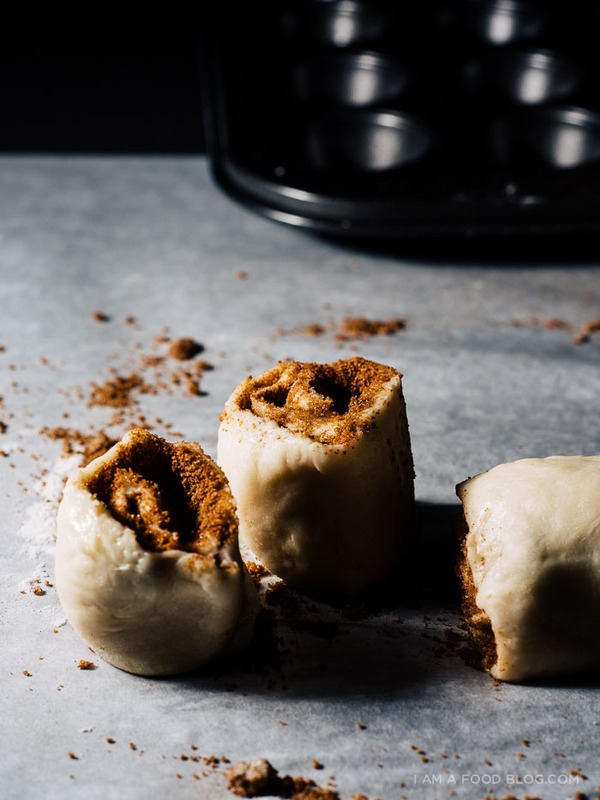 If you’re looking to make chocolate espresso cinnamon buns, check out Joy’s recipe! I love your stories about Tokyo. I wish so bad I can get there someday, but in the meantime let me listen to your stories and ill picture myself standing in line for a cinnabon with you;) I love cinnamon rolls and even better when the only take an hour! Great addition of the booze btw! Thanks so much for sharing! I haven’t had a cinnamon roll in forever and I’m way overdue. Plus, whiskey cream cheese glaze?! Drooling. i want to make those!!! Awesome recipe! Btw, is the amount of butter in filling 1 tablespoon or 1/4 cup? Making brunch and having people over is my favorite meal to entertain. Love this and the prep time is just right! A one hour recipe like this is just what I’m looking for…and that sauce looks daaaaaaang good! OMG…..Time to re-think my photography….and my cooking. Loving this site so much and added to my faves. And now…..Back to the drawing board. I’m not usually a fan of cinnamon rolls, but these look so delicious! 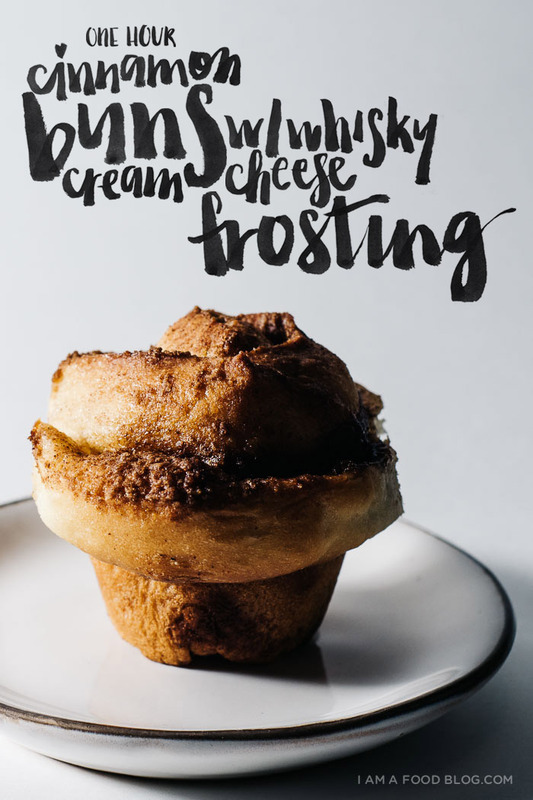 The whisky cream cheese frosting sounds so good! Thank you so much for sharing. I’ll definitely be making these for brunch one of these weekends. Oh my, oh my. There is something quite magical about these. I love how they’re baked in a muffin tin for almost a popover shape! Do you have any suggestions to replace the whiskey, which, I know, hypothetically, isn’t exactly replaceable, but perhaps something equally delicious? ooh, if you’re want to skip out on the whiskey, you can feel free to do so. it just adds flavour and thins out the frosting a bit. but if you don’t use it and slather on the frosting when the buns are warm, it’ll be fine as well! OH YESSS!!!! Can’t wait until it’s sunday again so I can make these! They’re perfect. OH my god Stephanie!! My favorite dessert, EVER, with little hassle and topped with whisky cream cheese glaze? It’s like you put together specifically so that I’m going to screw my new year diet (although let’s be honest, it wasn’t really consistent anyways!) and gobble up a bunch of these!! Loving ALL your brunch ideas! Oh my goodness! When I saw this post, my heart squealed with joy! 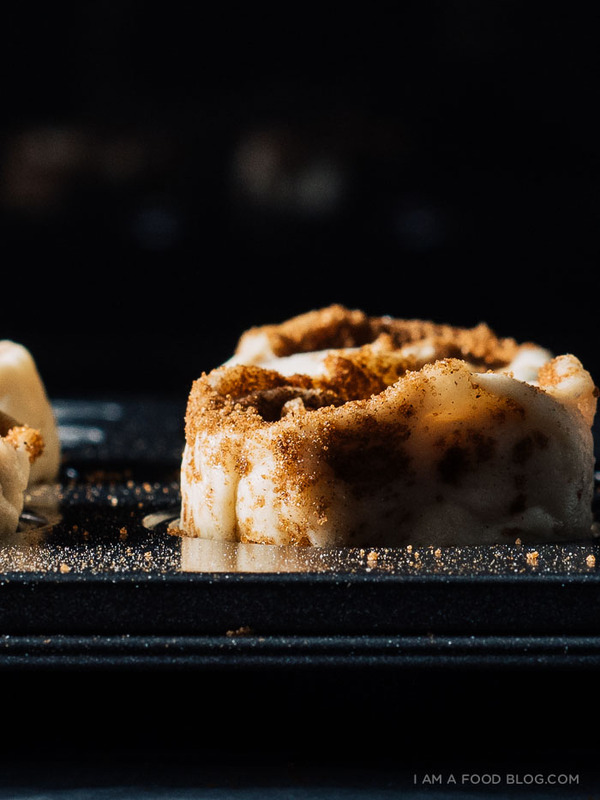 Growing up, I loved going to Cinnabon with my dad and eating ooey-gooey cinnamon rolls! I’m careful now because I love sweets so much that if I get carried away, I’ll eat way to much than I should! 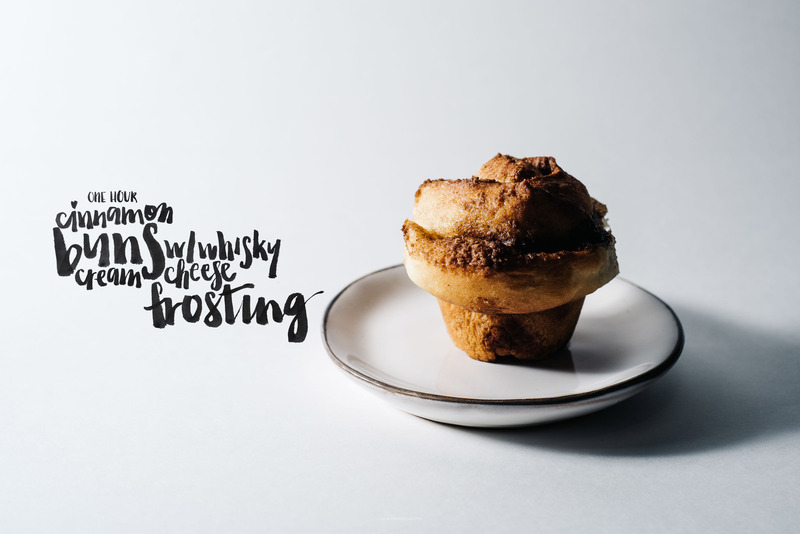 This cinnamon bun recipe sounds amazing! I’ll definitely have to make these one day for some kind of special event or occasion! Ahh..MUST MAKE THESE! Those look unreal. We’ll be skipping the brunch lines for sure :) this recipe’s definitely on the books! Hope you have an awesome, amazing Vday. What do you think about making these in a regular muffin pan? It’s all I have! they would definitely work, just cut the buns a little bigger, or if you cut them in 8, they just won’t have that muffin top thing going on. hope that helps! 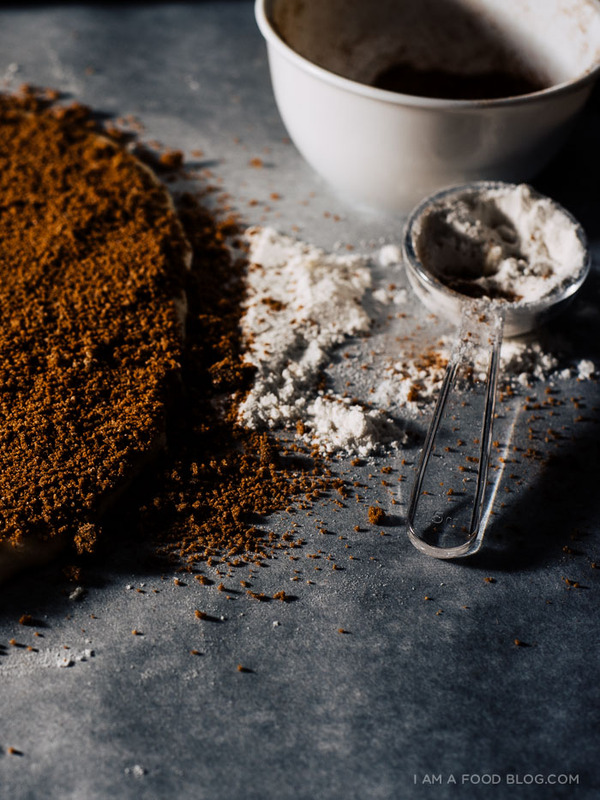 Is there really only a total of 1 cup flour? yes! it only makes 8 mini buns – they’re about 2 inches each. you can check out the recipe i based it on here: http://joythebaker.com/2015/01/quick-dirty-chocolate-espresso-cinnamon-rolls/ if you need a bigger recipe. do you think if i doubled the recipe it may make similar rolls in a regular muffin pan? i think that would definitely work! you could also just make this recipe in a regular muffin pan, you just won’t get that large muffin top that you see here.